Our North Carolina car accident lawyers hate to hear the news of a multiple vehicle crash on one of our state highways because they nearly always result in serious injuries or death. Recently a five-vehicle crash occurred on N.C. 211 west of Taylortown and near the rear entrance to Pinewild Country Club. The North Carolina Highway Patrol investigated and Trooper J.C. Burroughs said that Stevie Lee Holder, 47, from Cameron, was going east on N.C. 211 in a 2000 Ford pickup when hit rear-ended a 2003 Toyota knocking it off the road and down an embankment. The driver of the Toyota claimed she was slowing down because of the construction on N.C. 211 causing vehicles in front to come to a stop. Holder’s pickup rolled over and hit a 2004 Ford Explorer causing a chain reaction involving two other vehicles. The Toyota received heavy rear damage and was driven by Jane Ellison Austgen, 65 years of age, who was not seriously injured. Holder, who was alone at the time, was taken to First Health Moore Regional Hospital where he was pronounced dead. The area where the accident occurred has been under construction since November 2011, when the $29.4 million project began to widen the roadway to a four lane highway with a grassy median. The N.C. Department warned drivers to be cautious when driving through the construction zone and to pay particular attention to flagmen directing traffic for trucks entering and exiting the area. They said traffic congestion will continue during times when there are lane closures in the project area. However, in order to accommodate traffic during peak hours, no closures will be made from 7 to 9 AM and 4 to 6 PM, Monday through Friday. There will also be no closures between Gun Club Drive and the Pinehurst traffic circle between 6 AM and 8 PM, Monday through Friday. Construction is said to continue until June 2014. 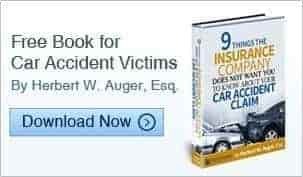 The North Carolina auto accident lawyers at Auger & Auger are accustomed to dealing with multiple-vehicle accidents and the serious injuries and deaths that can result from them. If you have been involved in a major accident like this, it is much more complex than your normal two-vehicle accident, and liability for any injuries or deaths is often hotly contested. The issue of what parties are culpable requires the experience and commitment of Raleigh multiple-vehicle accident attorneys like Herbert W, Auger and Arlene P. Auger, who have been helping people in Charlotte and others throughout the state for nearly 40 years. In a case involving a construction area like the one described here, any of the involved drivers may have been negligent with respect to their speed, lookout, failure to control their vehicle, among other things. Additionally, the contractor or driver of one of the construction vehicles entering or exiting the site may have been negligent. Our firm is prepared to advocate for you to protect your rights and ensure justice is served. Contact us for your own personal, confidential, no obligation consultation to discuss your particular case. We have three offices in Charlotte and one each in Raleigh and Greensboro, for your convenience. All of our cases are handled on a contingency basis which means you do not owe us any fee unless we make some monetary recovery for you. Our North Carolina Worker’s Compensation Attorneys understand that construction sites are dangerous places because of all the different contractors and employees performing their skills simultaneously. However, not all injuries on the job fit that mold. In 2009, James A. Hunt, a Fairmont Middle School Principal, was driving to work and was on his cell phone (which the school district provided for him) discussing school business with a colleague when he was struck by a shotgun blast to the face and hand by an unknown assailant who had pulled up next to his car. Mr. Hunt suffered extensive injuries, resulting in several operations, including plastic surgery, to repair his right hand, teeth, mouth, and face. Police investigation did not result in the arrest of the perpetrator. He then filed his worker’s compensation claim in 2009. Initially, his claim was denied, was later approved, and then wound up in the North Carolina Court of Appeals when his employer appealed. Testimony in the case revealed that Mr. Hunt had been involved in anti-gang activities in his role as school principal and had actually been threatened by the parents of some of the middle school students. He was also concerned that some of the school staff members that he had previously disciplined may have wanted revenge. During his testimony, it was revealed that he received a travel allowance from the school in the amount of $594 two times a year, which was provided for in his employment contract. The school district denied the claim based upon the “going and coming” rule, which would normally bar worker’s compensation benefits for those injuries sustained while commuting to or from the job, and therefore the accident did not arise out of the course and scope of his employment as a middle school principal. A North Carolina hearing officer ruled in favor of Mr. Hunt and the North Carolina Industrial Commission on appeal agreed, saying that his injuries occurred while working and awarding temporary total disability benefits. The ruling was appealed to the North Carolina Court of Appeals by Mr. Hunt’s employer, the North Carolina Department of Public Instruction, and Corvel Corporation (the third-party administrator). The Court ruled that since Mr. Hunt was required to be on call 24 hours a day, seven days a week, and that he was speaking with a colleague at the time of the shooting, and that such was a permissible use of the school provided phone, that the shooting did, infact occur during the scope and course of his employment, and as such, was a compensible injury. The court further ruled that since the provided travel allowance was used for communting expenses, the “going and coming” rule was inapplicable. If you or someone you know has been injured in the course and scope of employment or has questions regarding whether the injuries sustained are covered, you need to seek the advice of a North Carolina Worker’s Compensation Attorney. Every employer with three or more employees must provide worker’s compensation insurance. This entitles you to medical benefits and weekly compensation checks if the injury keeps you off work for more than 7 days. Statutory weekly benefits are 66 2/3% of your average weekly wage, not to exceed $862 per week, for injuries sustained on or after January 1, 2012. Injured workers may also entitled to a lump sum settlement based upon the nature and extent of their injuries. Auger & Auger has helped injured workers in Charlotte and throughout North Carolina receive the benefits to which they are entitled and the maximum lump sum settlement possible. Contact us today for your confidential, no obligation consultation to discuss your particular case. Our experienced team, headed by partner, Herbert W. Auger, will make sure your case is handled quickly, professionally and aggressively. Our North Carolina Car Accident Attorneys have seen all types of accidents in the nearly 40 years of combined experience that they have. The story below reminds us that our lives can change forever in a split second while driving a car or operating any kind of motor vehicle. Thomas Richard Jones, 54, is leaving prison on April 10, 2012, after serving roughly 15 years in a case that led to the North Carolina Supreme Court case which ruled that impaired drivers cannot face first-degree murder charges. The news opened old wounds and painful memories of the two Wake Forest University sophomores who were killed on September 4, 1996 shortly after 10:30 PM in a car accident when their vehicle was struck at an intersection by Jones, who had been drinking, taking prescription medications and had been convicted of 20 prior traffic violations, including driving while intoxicated. The girls had all piled into Fiona Penney’s Mazda to go to a party. Maia Witzi and Julie Hanson were both 19 year old college students known for their community involvement and members of Chi Omega sorority. Jones struck their vehicle broadside after already hitting another car only a few blocks earlier and fleeing. Aline Iodice, Paige Warren and Fiona Penney all suffered serious injuries. Witzi and Hanson were killed. In 1997, Jones became the first person in North Carolina convicted of first-degree murder in an impaired-driving case. The North Carolina Supreme Court overturned the conviction saying prosecutors were wrong to pursue 1st degree murder in a DWI case. A new trial was ordered and the case was retried in 2003, during which Jones entered a guilty plea to 2nd degree murder and was sentenced to 15 to 18 years and 9 months, with credit for time served. The case made headlines as well as impacting DWI laws across the country. The North Carolina car accident attorneys at Auger & Auger and our experienced staff can help you when you and your loved ones are faced with serious injuries, maiming and the loss of life caused by drunk drivers. After you receive that late night phone call advising you that your husband, wife, son, daughter, mother or father have been in a terrible accident with a drunk driver, your mind goes blank. You do not have the mental capacity to figure out what to do next and how to deal with insurance companies. Auger & Auger will take the reins for you and determine if any photographs were taken at the scene, track down witnesses, talk to investigating officers, take pictures of the damaged vehicles and hire an expert to testify, if necessary. Please contact us to schedule a mutually convenient time for you to have your confidential, no obligation consultation about your situation. We have five convenient offices, three in Charlotte and an office in Raleigh and Greensboro. All of our cases are handled on a contingency basis so you will never owe an attorney fee to us unless a monetary recovery is made for you. Our North Carolina Personal Injury Attorneys know that your child’s safety and well being are of paramount importance to you while you are away at work and they are at your local day care center. Unfortunately, we see stories in the news everyday about children being mistreated, sustaining injuries and even killed while at their day care centers. A few months ago, Charlotte Mecklenburg Police arrested three people in a drug bust at a home next door to the Tele-Time Academy day care center in East Charlotte. Desmond Nelson, 21, was charged with possession with intent to distribute cocaine within 300 feet of a school. He was also charged with related drug paraphernalia charges and weapon charges. Sekeena Woodward, 39, was charged with possession of marijuana and drug paraphernalia. A third person, Alexis Jackson, 29, was arrested on outstanding warrants that were not related to possession or distribution of drugs. Previously, parents of children at the day care facility had complained about being hassled by the people hanging out at the house next door. In another case, a former day care center employee was charged with assaulting five children while employed at Kid’s Korner Child Development Center in Kannapolis, North Carolina. The employee, Whitney Belk, was charged after parents complained to the center and police were alerted. Belk was fired from the day care center after she was caught on a surveillance camera mistreating five different children, according to Cindy Stack, the founder of Kid’s Korner. After the charges were filed, Ms. Stack and her daughter, who runs the center, organized a parent meeting to discuss what had happened and to assure them that their children would be safe there. This was allegedly the first incident the facility had since its beginning in 1984. Finally, a three year old Gaffney, South Carolina, girl was killed when she bumped into a pile of wood causing it to fall on her in the gym at West End Baptist Church. Tragically, she died after being airlifted to Spartanburg Regional Hospital. If you or someone you know has been unfortunate enough to have something happen to your child while at a day care center, you should contact us to schedule a time for you to come in to our offices for a confidential, no obligation consultation. We have five offices conveniently located in Charlotte (3), Raleigh (1) and Greensboro (1), and our experienced staff will be happy to arrange a time convenient for you. All cases are handled on a contingency basis, meaning you will owe no attorney fee unless a monetary recovery is made for you. While highway accidents are always bad news, our North Carolina truck accident attorneys understand that accidents involving an eighteen wheeler or some other large truck often result in substantial injuries, if not fatalities. An eighteen wheeler tanker rig traveling eastbound crashed and burned on April 3, 2012 at 10:08 PM near mile marker 54 on I-26, close to Flat Rock, North Carolina in Henderson County. The driver of the truck was listed to be Allan Thomas Vandamme, 43, from Ontario, Canada by the Highway Patrol. He narrowly escaped death by crawling out of the cab of the truck before it was engulfed in flames and was taken to the Mission Hospital for treatment and observation. The accident occurred in a curve before the Peter Guice Memorial Bridge and the Highway Patrol has been unable to determine if speed, driver inattention or mechanical failure caused the accident however, charges are pending. Western North Carolina Haz Mat closed down I-26 in both directions and evacuated nearby residents, since the tanker was carrying sulfuric acid. Engineers will examine the bridge for damage done by the sulfuric acid or the intense heat from the fire, as reported by WSPA-TV. North Carolina is ranked 6th in the United States for having fatal accidents involving eighteen wheelers. Make no mistake about it, being involved in an accident with a tractor trailer rig is a serious matter that often ends up inflicting victims with catastrophic injuries or fatalities. Whether the accident is a head-on collision, a rear-end collision, a sideswipe, a jacknife or a rollover, the physics involved in such a collision is mind boggling. A standard car, pickup truck or SUV generally weighs between 3,000 and 5,000 pounds. A fully loaded eighteen wheeler can tip the scales at around 80,000 pounds (40 tons) and when traveling at speeds between 55 and 70 miles per hour, tragedy is only a blink of the eye away. In an effort to reduce truck accidents, the U.S. Department of Transportation’s Federal Motor Carrier Safety Administration (FMCSA) has reduced the number of hours that professional drivers can work in a week in order to promote safety. Important provisions are: a reduction of the number of hours that truckers can drive from 82 hours in seven days, down to 70 hours; drivers cannot drive after working 8 hours without taking a 30 minute break and they can take a break whenever they need one during the 8 hour window. The final rule retains the current 11-hour daily driving limit. Companies that violate the 11 hour driving limit by 3 or more hours can be fined $11,000 per offense and the drivers themselves could be fined up to $2,750 for each offense. Whether an eighteen wheeler accident like the one in Henderson County is caused by speed, driver inattention or some other negligence on the part of the driver of the rig, parties who suffer catastrophic injuries or death can recover under the doctrine of respondeat superior. Respondeat superior is a Latin term which means “let the master answer” and was established to define the legal liability of an employer for the actions of an employee. Therefore, the employer-trucking company can be held responsible for the injuries to others caused by the negligent acts of its employee-driver that occur within the course and scope of his employment. The North Carolina Personal Injury Lawyers at Auger & Auger have nearly 40 years of collective truck accident experience dealing with major insurance companies who represent large trucking firms. Please contact us to schedule your confidential, no obligation consultation to discuss the particulars of your case. All of our cases are handled on a contingency basis, which means that you will owe no attorneys’ fee unless there is some a monetary recovery made for you.